On February 19 1969, promotor Ed Francis presented a professional wrestling card at the Honolulu International Center which included two championship matches, a six-man tag team match, and three other matches. In the opening match Chief Billy White Wolf won a one fall match over Bob Boyer. 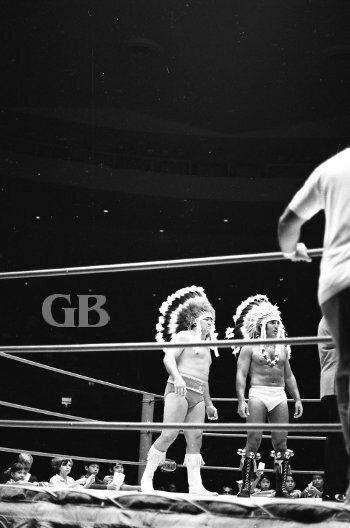 Chief Wahoo McDaniel (left) appears in the corner with fellow chief Billy White Wolf before the first match. In other matches Rocky Montero and Bobby Shane battled to a one fall draw, and Tex McKenzie defeated The Mummy in a two out of three fall match. Bobby Shane grinds away with a headlock on Rocky Montero. Rocky Montero applies his unusual version of the Abdominal Stretch finishing hold on Bobby Shane. Tex McKenzie confronts the unorthodox moves of The Mummy. The Mummy catches McKenzie off guard with a rake across the eyes. In a six-man tag team match. Don Chuy, NFL Rams football player, pinned Roger Kirby to give the team of Chuy, Wahoo McDaniel and Ray Stevens a one fall win over the team of Ripper Collins, Luke Graham and Kirby. 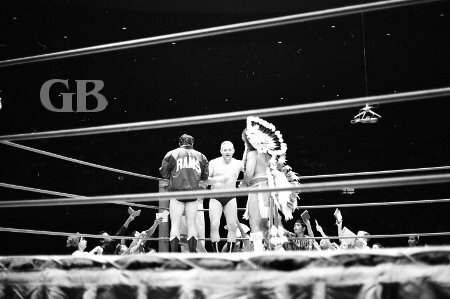 Ray Stevens, Don Chuy (back to camera), and Wahoo McDaniel go over match strategy as eager fans beg for autographs. 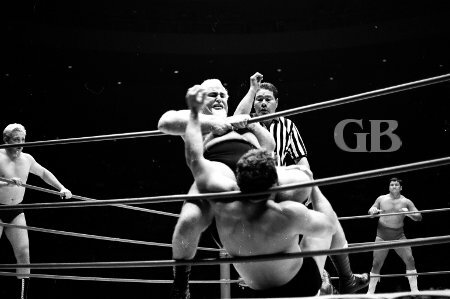 Luke Graham jams Don Chuy's neck onto the ropes as Stevens and McDaniel look on helplessly from outside the ring. LA Rams player Don Chuy prepares to throw a flying tackle on Luke Graham. Ripper Collins takes his favorite stance and begs for mercy as Ray Stevens moves in. 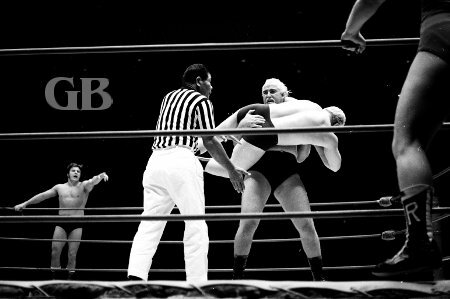 Luke Graham catches a flying Ray Stevens off the ropes. 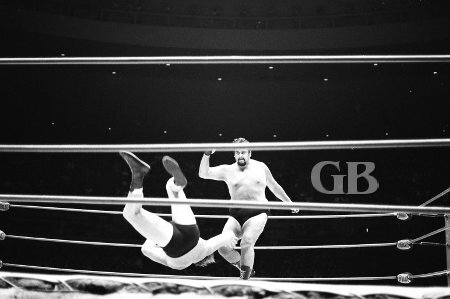 Ray Stevens hits Roger Kirby smack on the face with flying drop kick. In the first main event, Curtis Iaukea, returning to Hawaii after a 6 month world tour, defeated Nick Bockwinkel to win the Hawaiian Heavyweight Championship. 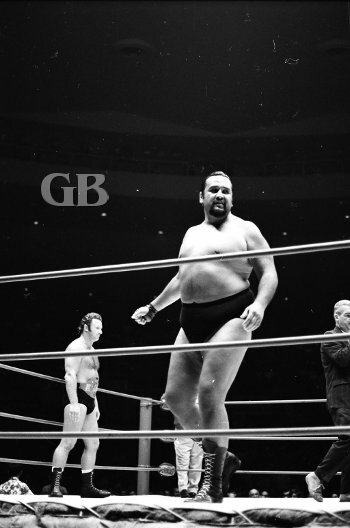 A "slender" Curtis Iaukea struts around the ring as veteran sports reporter Jim Lathrop announces the match. Nick Bockwinkel about to Body Slam Iaukea. 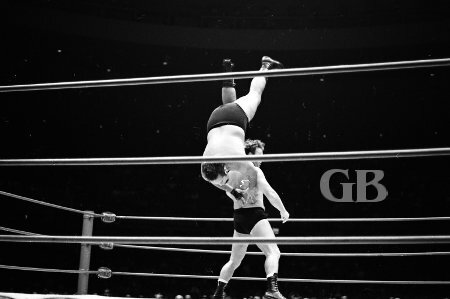 Iaukea soars backward from Bockwinkel's Sunset Flip. 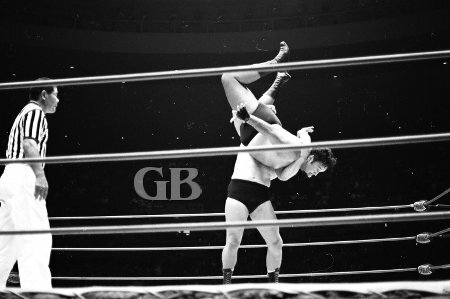 Curtis Iaukea tries to hang on after Bockwinkel applies his classic version of the Abdominal Stretch. See Montero's version above. 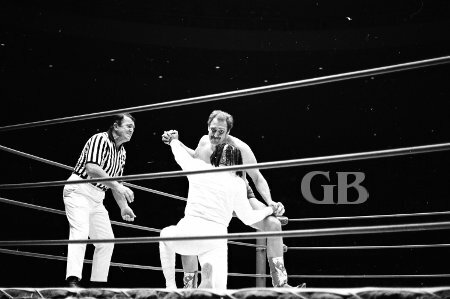 Bockwinkel readies a knee to Curtis' face. Iaukea unleashes a vicious Body Slam on Nick Bockwinkel. 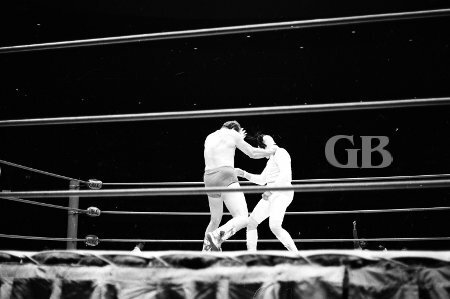 The main event was originally set as an NWA World Championship match with Gene Kiniski defending his title against North American champion Professor Tanaka. However, Kiniski lost his world title to Dory Funk Jr. on February 11 in Tampa Florida. Thus promotor Ed Francis was forced to change the match. 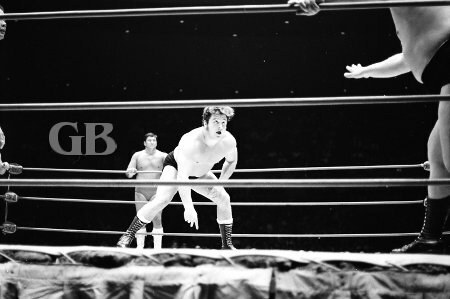 In place of a World's title match, he presented a North American title match with champion Tanaka versus Kiniski the challenger. Kiniski defeated Tanaka to become the new North American Champion. 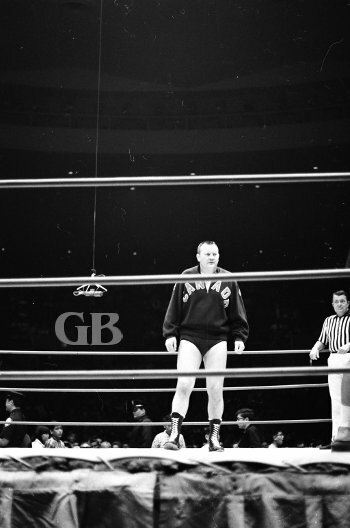 Recently dethroned World Champion Gene Kiniski prepares to battle Professor Tanaka. 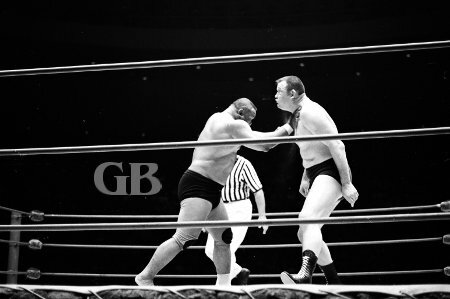 Professor Tanaka surprises Kiniski with an uppercut to the belly. 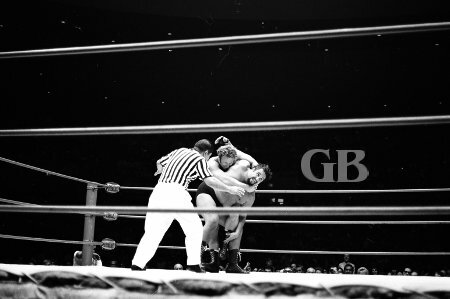 Kiniski suffers another lethal blow from Tanaka. The Professor dispatches a brutal chop to the chest of Kiniski.